In just a few days’ time ESA’s Rosetta mission is going to come to a close in a most extraordinary fashion, because the spacecraft is going to slowly, and deliberately crash-land into the comet that it has been orbiting for the past two years. Euronews is with the team as they prepare for this dramatic finale. This has been a mission full of surprises. The first was when Rosetta kept everyone waiting for it to wake up from a long hibernation. Then, in November 2014, Rosetta’s tiny probe Philae landed on the comet. It bounced, twice, then disappeared from view. Two years of science followed as Rosetta surveyed the comet on its closest approach to the Sun. Then there was another surprise, a few days ago, when Philae was finally spotted in a shady corner of the comet. “We’re going to land on the comet, once more, this time with the mother-ship,” says ESA’s Head of Mission Operations Paolo Ferri. “The spacecraft is not designed to land and will not survive the landing, for sure, there’s no doubt,” says Rosetta Flight Director Andrea Accomazzo. “The location we’re targeting is a real scientific goldmine,” says Rosetta Project Scientist Matt Taylor. The dramatic finale will come on Friday 30th September. On that day Rosetta will put itself on a deliberate collision course with the comet. “If we take a model of the comet, on the ‘head’ of the duck there’s this area that’s called Ma’at, which is a pretty interesting area because it’s a very active region, and in particular on this side there are two areas, what we call ‘pits’, holes which produce gas and dust. So the idea is to come with Rosetta and land near these holes,” says Rosetta Operations Engineer Armelle Hubault. 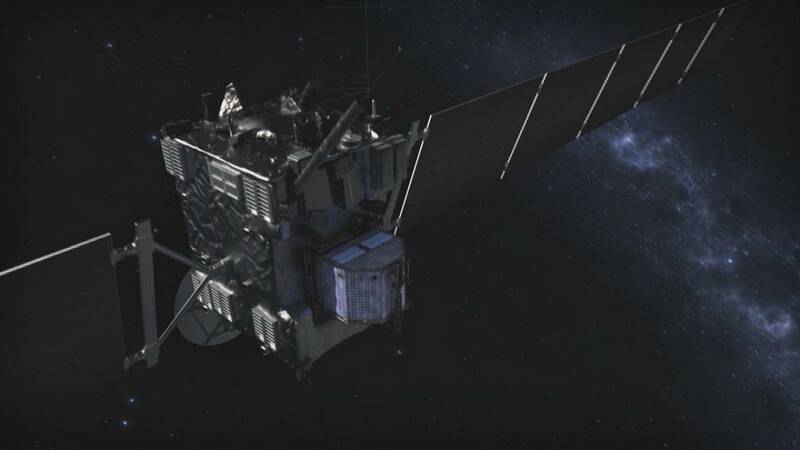 Thanks to its careful custodians, Rosetta has resisted 12 years in space. However it will not be able to resist this. “The structure of a satellite is very lightweight and very fragile. Rosetta in particular was absolutely not made to be able to withstand gravity, because it’s a satellite in orbit around a comet, a small weak body,” continues Hubault. “At the moment of impact Rosetta will be crushed, the solar panels and the antenna will be flattened onto the surface of the comet. Rosetta will remain on the comet forever, because there’s no way to get it off the surface of the comet,” she adds. The mission is over because, as it follows the comet away from the Sun, the spacecraft has less and less power from its solar panels. For its science masters this ending presents a unique opportunity to take data and photos right until the end. “The scenario we now have, this ballistic plunge from about 20 kilometres above the comet right down to the surface, is fantastic. It gives us this unique profile of what the coma, the outer atmosphere of the comet, looks like, right down to the surface. That’s probing something we’ve never probed before,” says Matt Taylor. Rosetta will send back high resolution photos of some of the most interesting parts of the comet, offering a peek inside this ancient lump of dust and ice left over from the early solar system. For all that to happen, Rosetta has to survive the last few days, as it flies close to the comet, and completes the final descent. “When flying very close to the surface of the comet the biggest risk is to have problems in the navigation, so in predicting where Rosetta will be around the comet. What we are doing now technically is much much more demanding than the day we landed with Philae,” says Andrea Accomazzo. In the final descent there will be no time to make adjustments. The team will just take the data, and cross their fingers. “If we’re lucky we keep the signal until the very end. We don’t know with which part of the spacecraft we will touch down. So, it could be that a solar panel touches first, and then the attitude of the spacecraft is disturbed. We may lose the signal. So the last few minutes are going to be a bit difficult to predict,” says Paolo Ferri. “Once it’s on the surface, we will lose the signal, the spacecraft will be programmed for that, because we don’t want to leave an active spacecraft on the comet that then could pollute the radio-frequency environment, so it will switch off, and that will be the end of the mission,” says Ferri. Expect many smiles and a few tears when this epic comet-hunting adventure comes to a close.